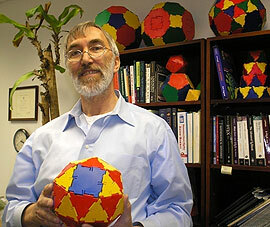 In this talk about geometry of triangles we will see two different proofs of Stewart’s theorem, derive formulas for important cevians, and solve several interesting geometric problems. 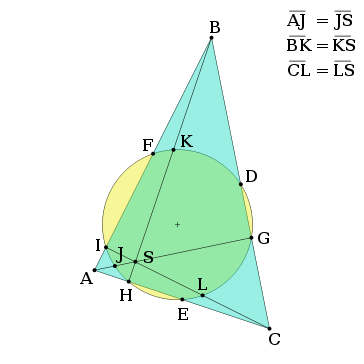 We will also look at other important points in triangles (Fermat point, centers of excircles, …) and look at the Euler line, the nine-point circle, and related problems. I haven’t even started writing yet and a lot of you probably already have several questions, so I’ll try to make this article a bit smoother by answering those first. 1. What the heck is a Minecraft? 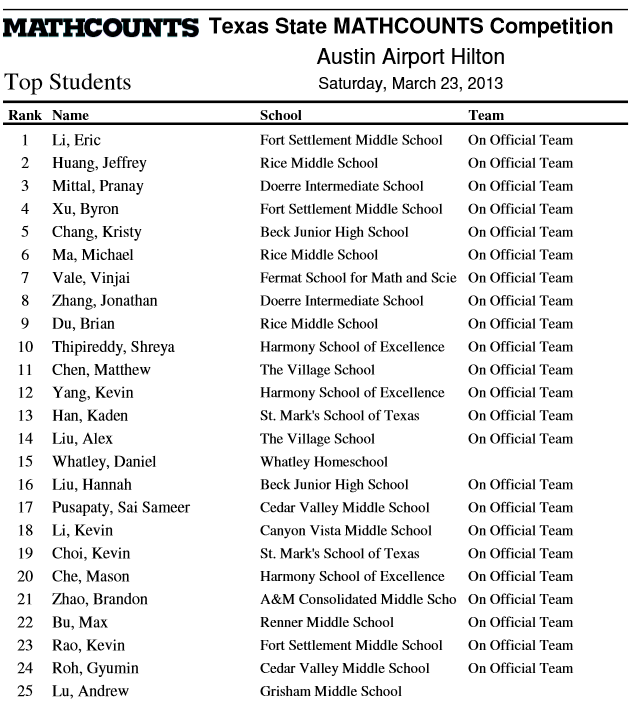 North Texas and Metroplex Math Circle participants were well represented in both the team and individual results at this year’s Texas State MATHCOUNTS competition. Congratulations to all of the participants. For 2ⁿ – 1 to be prime we also need n itself to be prime, but that is not sufficient. For example, 2¹¹ – 1 is composite even though 11 is prime. However, if you look at tables of Mersenne primes it is interesting to note that if you start with 2 and use that to make a new number 2ⁿ – 1 with n = 2 you get 3, then recycling the 3 you get 7, use n = 7 and you get 127, another prime! How long could this go on? Let f(n) = 2ⁿ – 1. The iterations you get, starting from 2, are f⁰(2) = 2, f¹(2) = 3, f²(2) = 7, f³(2) = 127, f⁴(2) = 1701411834604692317316873037158884105727. It turns out these are all prime! But what of the next one??? Well, it may be a very long time before any of us know. The largest value of n for which 2ⁿ – 1 is known to be prime is n = 57885161, and that after a concerted effort using volunteers from around the globe. Not much chance of answering this one in our lifetimes, unless some really new idea arrives.Before you make a hasty conjecture (as has already been done), a cautionary piece of history is in order. If you define a new function to iterate you get some other interesting numbers. Let g(n) = n² – 2n + 2. Then the iterates are g⁰(3) = 3, g¹(3) = 5, g²(3) = 17, g³(3) = 257, g⁴(3) = 65537, and all of these are prime! So, with forgivable excitement, the conjecture was made that all of these will be prime, especially as the next one, g⁵(2) = 4294967297, was much too large at the time for mere mortals to conceive of factoring with their bare hands. It takes a larger number to be “forever beyond reach” these days. Rather than the now puny 4294967297 we cower before f⁵(2) = 2¹⁷⁰¹⁴¹¹⁸³⁴⁶⁰⁴⁶⁹²³¹⁷³¹⁶⁸⁷³⁰³⁷¹⁵⁸⁸⁸⁴⁴¹⁰⁵⁷²⁷ – 1, and who can blame us? Join us in the first hour to hear MMC students present some of their favorite problems and mathematical concepts. In the second hour we will work on problems from the Purple Comet! contest and talk about this exciting opportunity to compete with other students around the world.